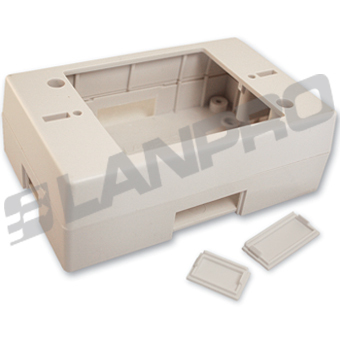 The LanPro surface mounted Mini-Boxes are used to distribute one or two network jacks or other services. They are of a small size, low profile and very discrete. They have precise covers that fit in with some pressure. They don’t need tie-wraps or else for fixation to a surface. 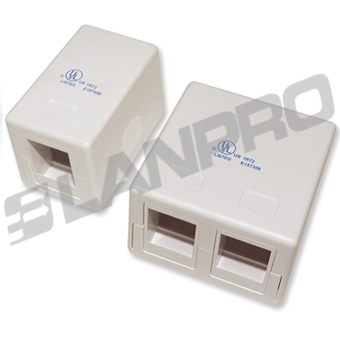 The surface mounted box LP-318W for faceplates from LanPro is the answer to the need of terminating network connections near work places or at network equipment when there are no embedded boxes in the walls or floor available. Their dimensions are compatible with U.S. style faceplates made by LanPro or other brands with screw separation of: 83.3mm (3.28”).